In our daily life, we have seen many things that adopt electronics as a basic concept. We could see it in our home like as televisions, listening music from a CD player or DVD player, listening radio, or just communicating by phone. We could find a computer in the office, print letter with a printer or just send a facsimile with fax machine. There are many devices which still have correlations with electronics; even we could see an advertisement board blinks leds from the top of the store. From all of example, we can conclude our life is fully depending on electronics device. You can imagine what will happen if an electronics device miss from our daily life. We may need to walk from one place to another place just for meeting someone, or we couldn’t use the device which is in front us now, yes computer. When talking about electronics, it really helps us on different things in our life. We can get a better life from that. The most important is we must always get an update and expand the knowledge so we can make better devices to make our days easier. It was discovered centuries ago about basic electricity when some of materials will attract one each other after being rubbed together. Actually electricity is an electron that continuously moves through the wires that is still have conjunction with voltage and current, but today we can find many circuits is wireless. That is something can’t easily explain with just a few words. Large revolution started at around 1948 years, which is this device name, is transistor that make possible to design a circuit with such a small size. Before 1948, there are many people still using vacuum tube which consumes electricity much. After 10 years transistor was found, there are integrated new device found again name as IC (Integrated Circuit). This IC itself contains many transistor and other compact components inside. 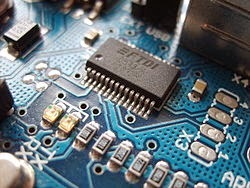 To make an electronic circuit, we need some tools like a pliers, screwdriver, drill, solder, soldering iron, etc. We need a material to attach the components as well like a PCB or just a breadboard. As a matter of fact, the circuit will never work if nothing to energize it. We need a supply as well like a battery. The first important formula that needs to know is Ohm’s Law. This formula was found by George Simon Ohm from Germany, he found relations about potential energy when electrons move from one point to another particular point. They are another Kirchhoff’s Law to bear in mind; you have to learn this as this makes a foundation for your further progress. As we progress, we need to handle such a high voltage and because electricity is dangerous we have to make sure our safety first. As a basic, you should need what is Hot, Neutral and Ground terms. Depth of knowledge about these terms makes us more safety when dealing with electricity. Electronics is our friend when we could use it wisely, but it could bite and kill you if you make some mistake. Want to learn to build a safety tools? See this Isolation Transformer. The most important is we must always get an update and expand the knowledge so we can make better devices to make our days easier.